“Whether a height variance between two sidewalk slabs is de minimis depends on all of the pertinent facts, and there is no simple standard to separate de minimis defects from actionable ones. St. Martin v. First Hospitality Group, Inc., 2014 IL App (2d) 130505 ¶14 (quoting Arvidson v. City of Elmhurst, 11 Ill. 2d 601, 604 (1957)). Illinois has held that, although a displacement of two inches in a residential area is actionable, a variation of only 1 1/8 inches is de minimis. Id. However, the de minimis rule’s application depends upon multiple factors, such as heavy foot traffic, distractions, and congestion. Id. at ¶ 19. In Barrett v. FA Group, LLC, the plaintiff, Rhonda Barrett, was injured when she stepped in a pothole in a parking lot maintained by the defendant, FA Group, LLC, and fell, suffering injuries. Barrett V. FA Group, LLC, 2017 IL App (1st) 170168, ¶ 1. The plaintiff testified that she was at the Red Pepper Lounge with friends when she was asked to move her vehicle. Id. at ¶ 12. The plaintiff left the restaurant to move her vehicle when she stepped down into a pothole filled with broken asphalt in the parking lot. Id. The heel of her foot became wedged in the pothole and she fell forward. Id. During testimony of the incident, the plaintiff was unable to estimate how much of a height difference was present. Id. at ¶ 14. Testimony of the owner of the defendant group averred that the subject pothole did not have a height difference greater than 0.5 inches between the depression and surrounding area. Id. at ¶ 17. The defendant moved for summary judgment on the basis of the de minimis rule and the trial court granted the defendant’s motion. Id. at ¶¶ 6, 22. In reversing the trial court’s decision, the appellate court noted that the defect was not so minor to be considered de minimis. Id. at ¶ 33. 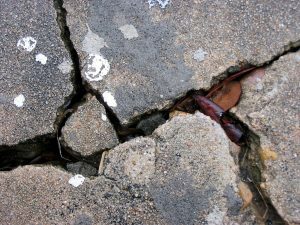 In deciding that the defect did not fall under the de minimis rule, the court focused on the fact that the plaintiff’s injury occurred at night in an area with dim lighting and the pothole was a depressed area, which contained broken pieces of asphalt within the depression. Id. at ¶ 35. In Bartkowiak v. City of Aurora, the plaintiff, Hollace Bartkowaik, was injured when she fell in an asphalt parking lot of the Route 59 Metra train station, maintained by the defendant, the City of Aurora. Bartkowiak v. City of Aurora, 2018 IL App (2d) 170406, ¶ 1. At trial, both the plaintiff’s expert and the defendant’s expert testified that the depression the plaintiff tripped on was at least 1.5 inches deep. Id. ¶ 19. The jury returned a verdict for the plaintiff, but answered yes to a special interrogatory, which led the trial court to determine that the depression was de minimis and not actionable as a matter of law. Id. ¶ 22. In reversing the trial court’s decision, the appellate court noted that the depression was in an area likely to be encountered by pedestrians, contained broken asphalt, was deep enough for the plaintiff’s foot to become stuck, the “madhouse” conditions of the congested parking lot, and the defendant’s employees’ testimony that the defect needed to be repaired because it was a tripping hazard. Id. at ¶ 36. A knowledgeable personal injury attorney will know how to apply the de minimis rule in premises cases. For more information on trip and fall cases, and premises cases generally, visit our page HERE. If you or a loved one has been injured in a premises case, such as in a trip and fall, contact the personal injury law firm John J. Malm & Associates to learn more about how you may be entitled to receive compensation.